Does this classic kid’s song ring a bell? In reality, at this point in the song momma duck is thinking about where her duckling went? While this song ends a few verses later with all the little ducks coming home safe, tragically, life isn’t always that easy for a duckling. Many of their real life stories don’t end as happy as in a kid’s rhyme, but, thanks to some amazing people, I’ve got nothing but good stories for you today. First, an educational aside: Mallards are large ducks with hefty bodies and are classified as dabbling ducks. This means that they feed in the water by tipping forward and grazing on underwater plants. 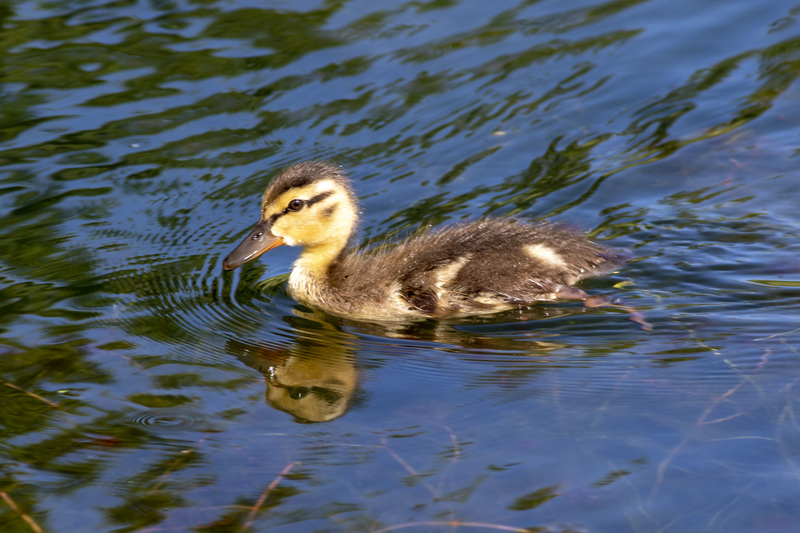 Mallards have little ducklings which can swim as soon as they hatch. 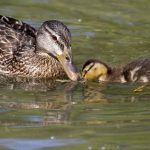 The mother duck must take her duckling directly to water when they are born, as this is the safest place for them, but this is where they get into trouble as they don’t always nest in smart places or travel on safe roads. This causes problems, sometimes orphans, and requires the help of some of our amazing rescue organizations. 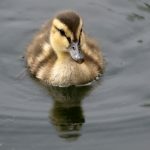 Back to the good stories: Over the years I have seen some amazing rescues of little ducks. Just the other week I was volunteering with Shades of Hope when I got a call from a man named Thomas. 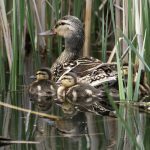 A momma duck had been hit by a car; the stories aren’t completely happy, but that’s often the reality of animal rescue, and all her babies were running around the side of the road. Thomas pulled over, safely and taking into account nearby traffic, and scooped up each of the 11 ducklings and put them in cab of his truck. When he told me he had them in his car, I was naturally thinking he had them in a box, but no. I opened the door to see and hear them running around the front of his vehicle without much care in the world. With a couple of helpers we carefully caught them and put them into a box. They will grow up together and then be released together. Another amazing rescue was with the help of Toronto Wildlife Centre. The momma duck had decided to build her nest on the deck of a family house. The residents gave the duck lots of space, and peace and quiet to sit on her eggs. The problem was when they hatched, there was no way to get them to water. Sarrah, a member of the TWC rescue staff, went in and caught a very stressed out momma duck plus her ducklings and in five minutes we were ready to take them to water. Momma duck and her ducklings took to the water so fast that the babies were actually running on top of each other to get away from us. While this whole incident may sound easy, believe me when I say that Sarrah is very experienced and had an experience-practiced plan of action that helped everything go smoothly. Rescue groups don’t usually get called unless an animal is hurt, sick, or there’s potential for injury. While I love the natural world and truly believe that all animals should be treated with respect and kindness, if you do see animals on the road, no matter how vulnerable they or their offspring may be, be safe and put your own life and the lives of other people first. Be absolutely sure that it is safe to pull over and that it is actually safe to step onto the road to help. The animal won’t understand what you’re doing and their first instincts will be fight or flight.